India’s Times Internet revamped its Gaana music streaming service in January, when it introduced mobile apps for the first time, and now it has taken a leaf out of Spotify’s book with the launch of premium offering: Gaana+. Gaana is much like other global streaming services in that the basic free service is supported by ads, but now users have another option. Priced at $2.99 per month and free from ads, Gaana+ enables them to play music offline — tracks are downloaded to their device — while the quality of streaming is higher (at 128kpbs) and downloads come at a near-CD rate of 320kbps. The launch of Gaana+ comes as the company also reveals that Gaana now has more than 1 million active users on mobile, and 5 million in total. Those figures are up from 3 million and, in conjunction with the new figures, Times Internet has released Gaana 2.0 for iOS. 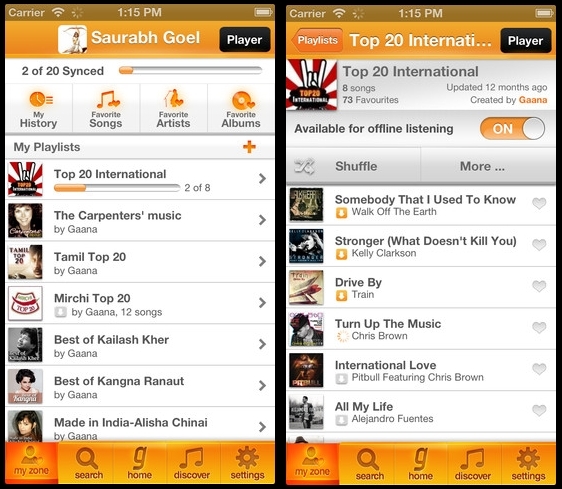 Mobile is the focus for the reborn Gaana service and the new version — which will make its way to Android, Windows Phone, BlackBerry and J2ME platforms in time — includes support for the premium service (and in-app purchases) as well as a number of new features, such as: one-click access to playlists, multi-rate streaming and improved search. Since it includes more than just Indian music and Spotify, which just stepped into Asia, is yet to launch in India, the attractive pricing of Gaana+ could glean plenty of attention in India and beyond. It is certainly a low cost option that will appeal to the Indian diaspora and domestic users alike. Gaana competes with the likes of Saavn, Dhingana, MusicIndiaOnline and Raaga in India, as well as a plethora of international services such as Spotify, Pandora, Deezer and Nokia Music. The Times Internet-owned service has the rights to more than 2 million songs which cover domestic and international music from over 300 record labels worldwide. Of its domestic rivals, Saavn launched a $3.99/month ‘Pro’ premium service in February 2013 and Dhingana — which has more than 15 million users and hired a new CEO this year — has a similar paid-for offering.